Performers include: Robert Ridgely, Diane Pershing, Allan Melvin, Melendy Britt, Bob Holt, and Alan Oppenheimer. This animated series is closely based on the classic Alex Raymond comic strip. Flash Gordon (Robert Ridgely), Dale Arden (Diane Pershing) and Dr. Hans Zarkov (Alan Oppenheimer) rocket to the distant planet of Mongo because its evil overlord, Ming the Merciless (Alan Oppenheimer), is planning to invade Earth. The team is eventually aided by Ming’s beautiful daughter Princess Aura (Melendy Britt) and helps to form alliances between Mongo’s warring inhabitants like King Thun (Allan Melvin) and the lion people, King Vultan (Allan Melvin) and the Hawkmen, and Prince Barin (Robert Ridgely) and his forest-dwelling people of Arboria. The group is later joined by a cute pet dragon named Gremlin. The Survival Game: A bounty-hunter named Arkon Vae is hired by Ming to capture Flash Gordon. He does but in the process they are both marooned on an island and must work together to escape. Flash saves Arkon’s life while fighting off a monster and, in the end, they join together to defeat Ming. Gremlin’s Finest Hour: Flash and his friends are sent on a mission into the past to find out what happened to the civilization of lizard people who lived in the north polar region of Mongo. The lizard people they encounter capture Gremlin because they believe he is their god reincarnated. Meanwhile, Flash and Dale discover the force-field which protects the city from the cold has been broken and they set out to fix it. First aired: November 1, 1980. 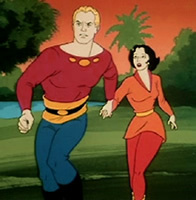 Many of the characters have appeared in later Flash Gordon incarnations but this version hasn’t been revived.